The Siemens Competition in Math, Science & Technology recognizes remarkable talent early on, fostering individual growth for high school students who are willing to challenge themselves through science research. Through this competition, students have an opportunity to achieve national recognition for science research projects that they complete in high school. 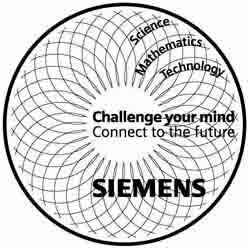 It is administered by The College Board and funded by the Siemens Foundation. time on Tuesday, September 22, 2015.